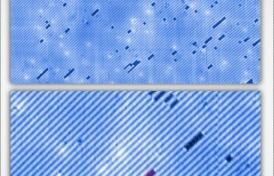 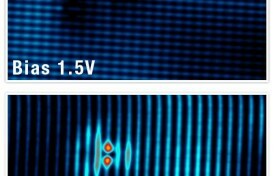 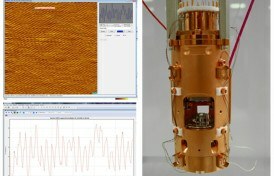 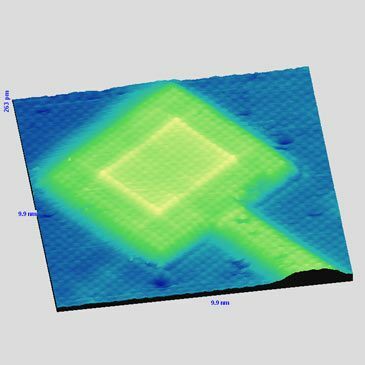 STM image (0.7 V/2 pA) showing two CoPc islands with kinks in different directions of the CoPc lattice. 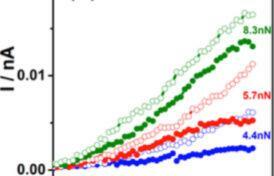 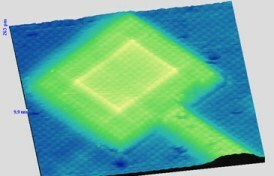 (b) Possible model to explain the kinks, where the shifted row jumps to the neighboring equivalent site. 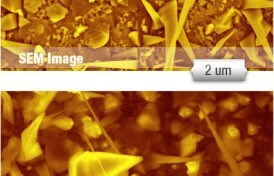 Image acquired at 50K. 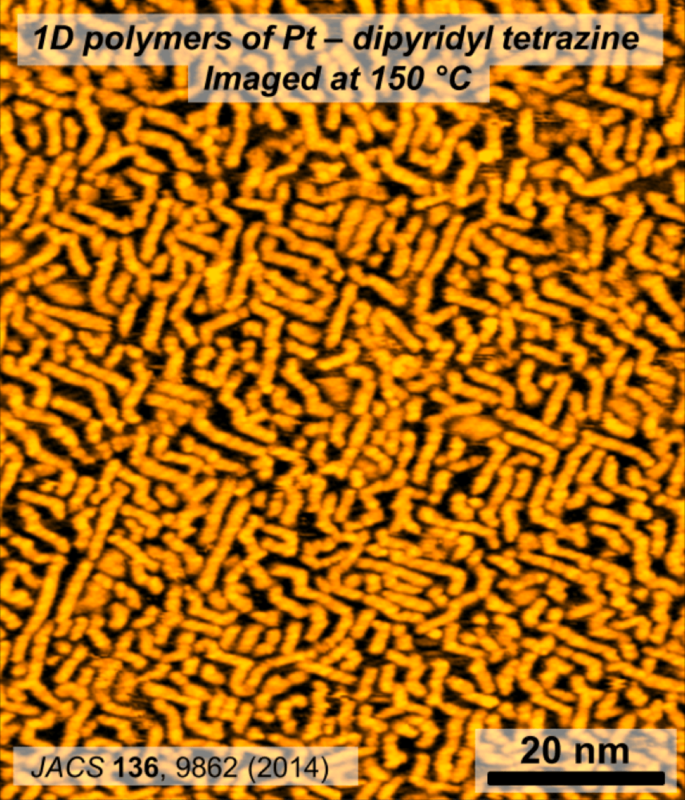 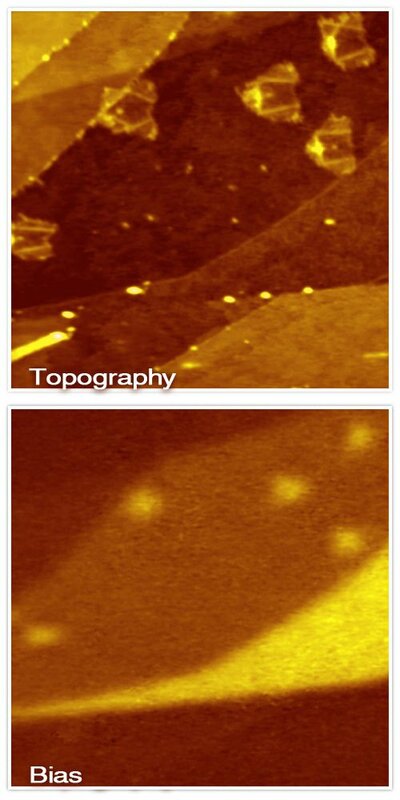 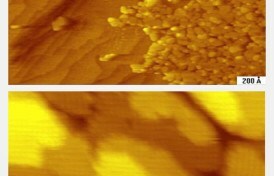 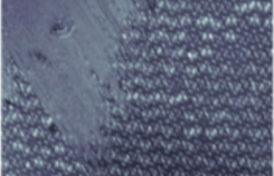 150 × 150 nm2 STM image (100 pA/0.16 V) of graphene on the Ir(111) surface before CoPc deposition. 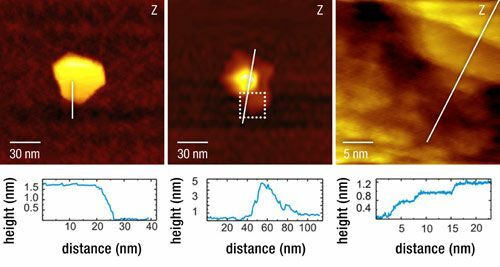 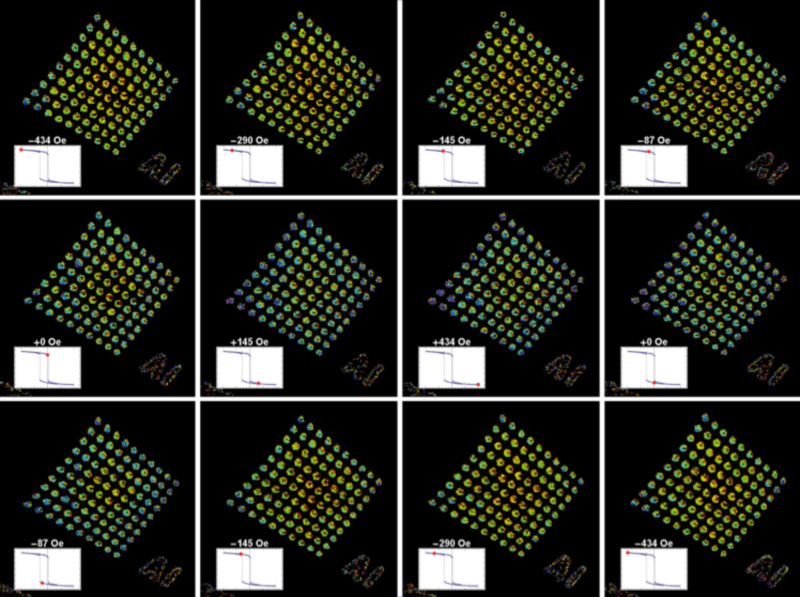 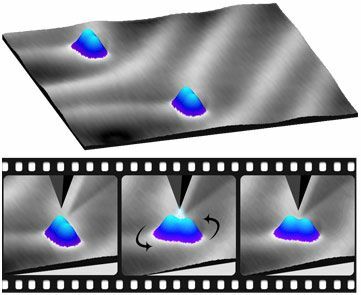 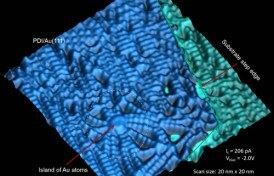 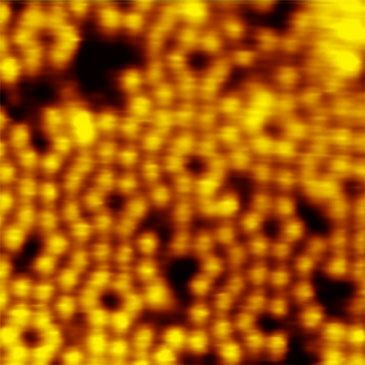 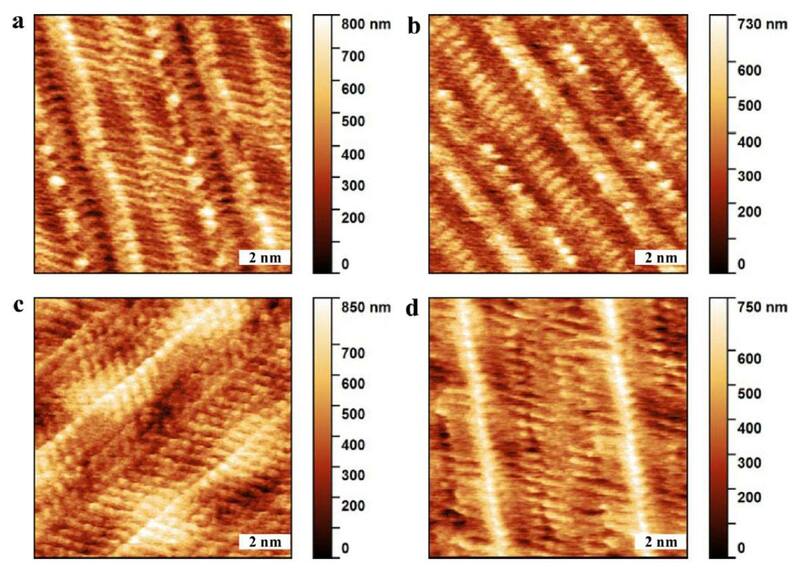 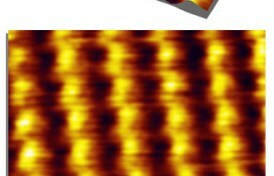 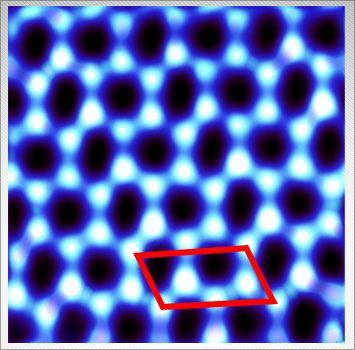 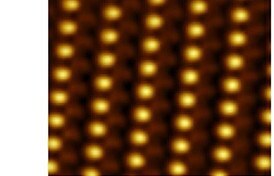 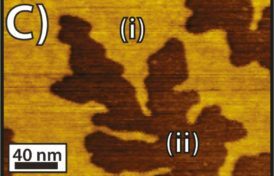 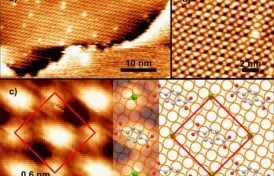 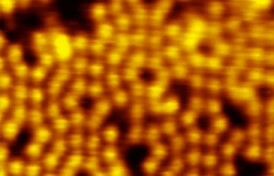 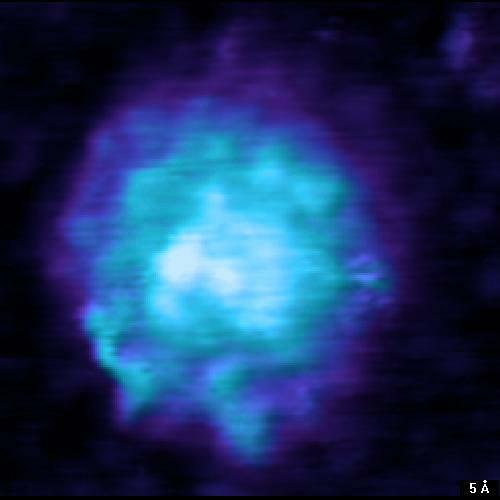 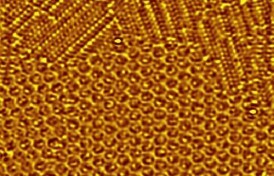 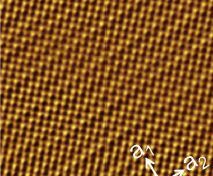 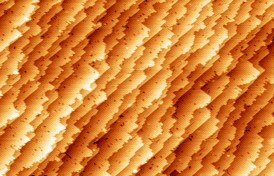 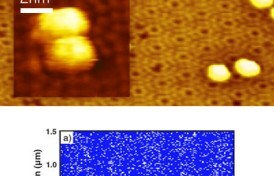 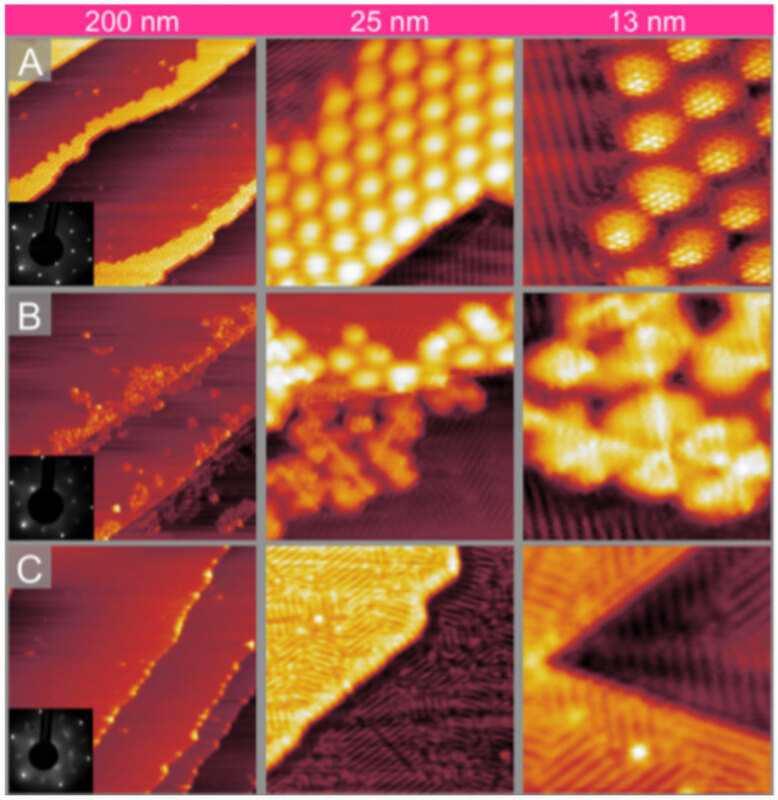 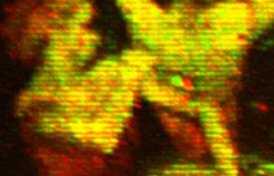 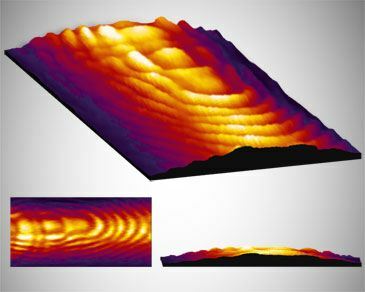 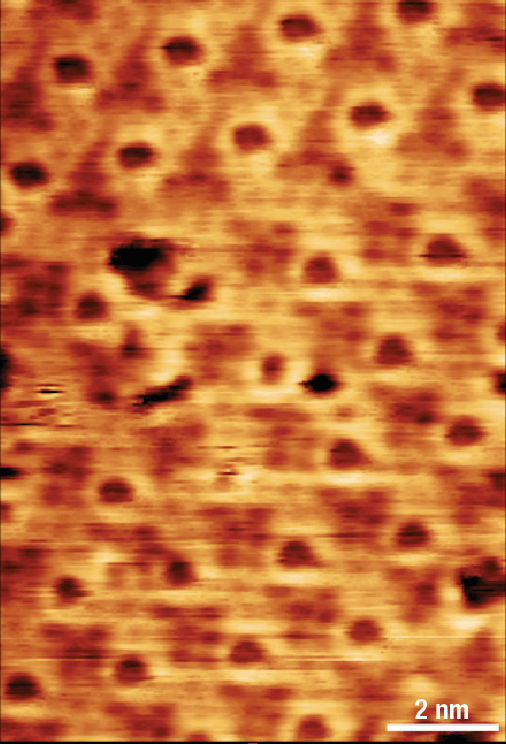 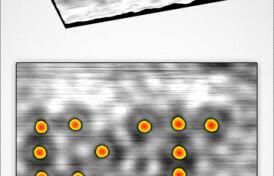 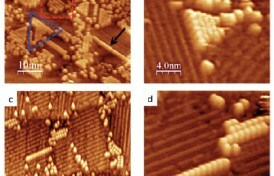 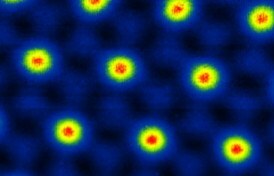 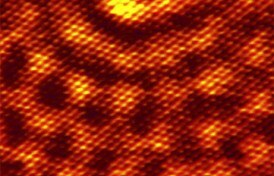 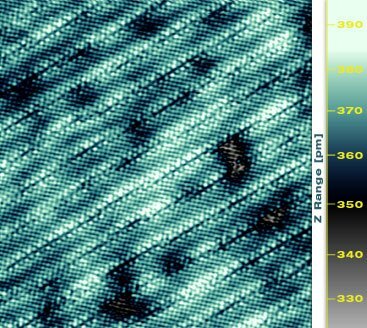 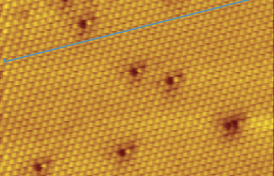 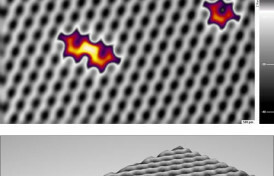 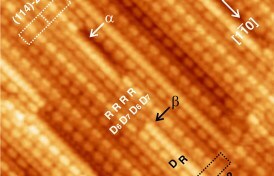 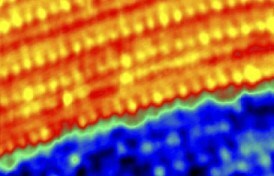 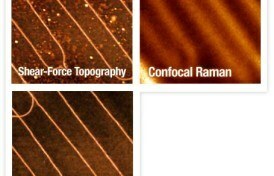 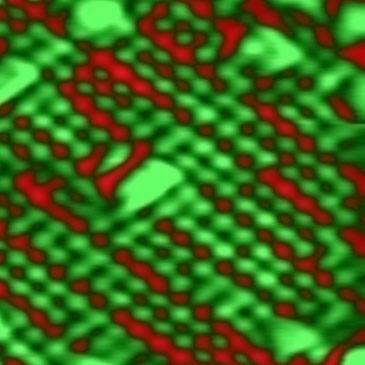 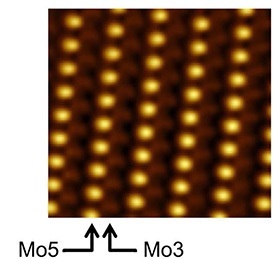 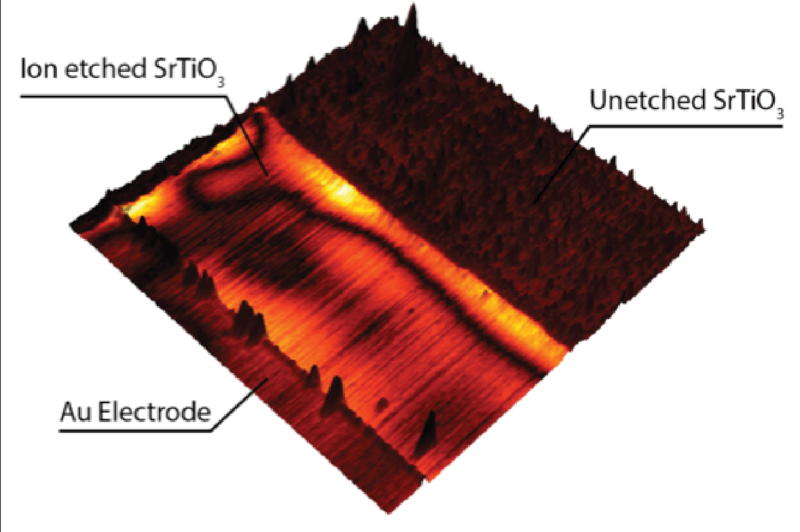 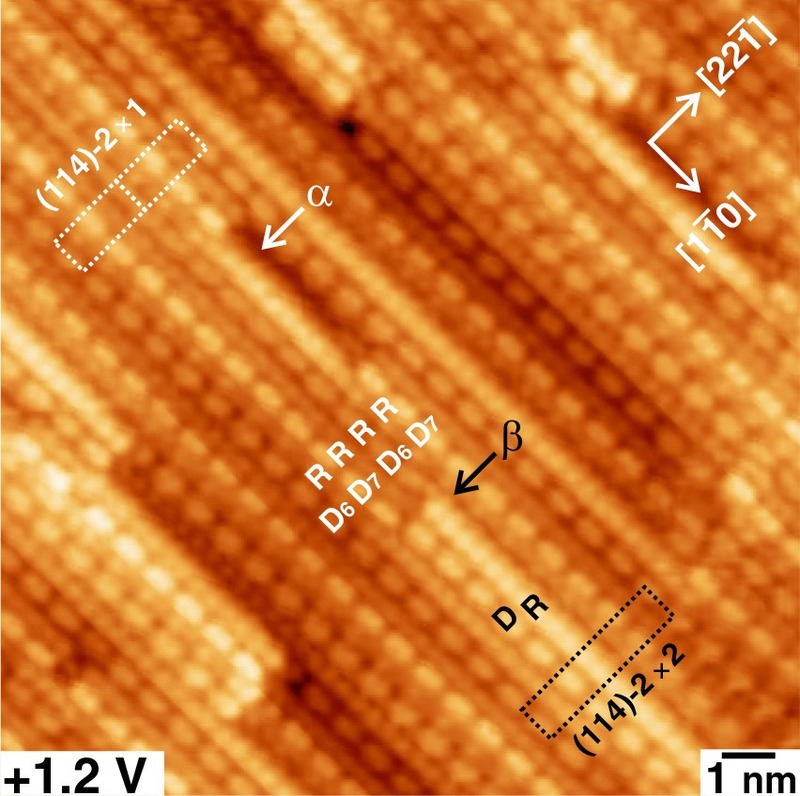 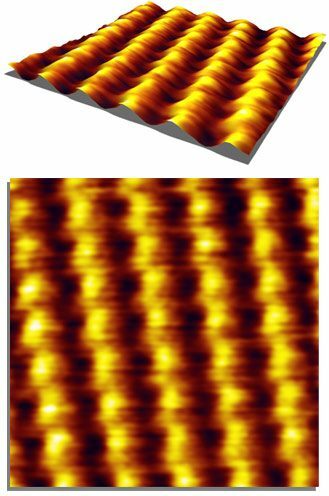 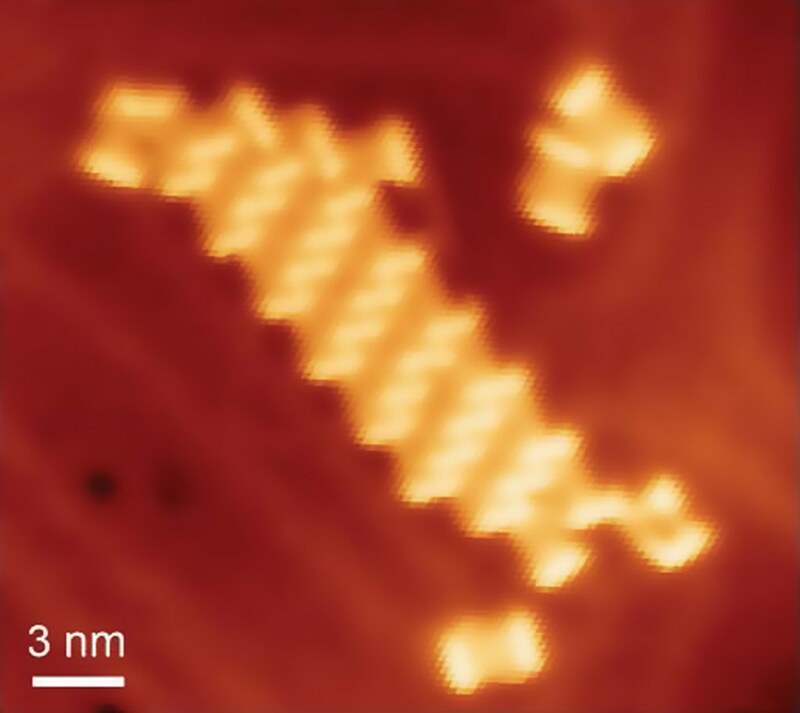 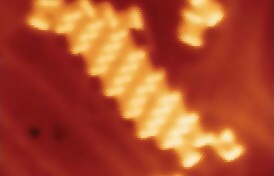 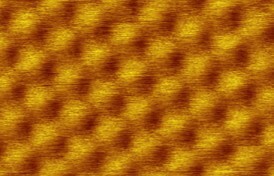 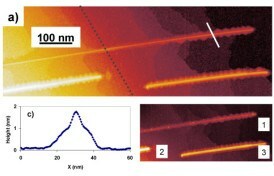 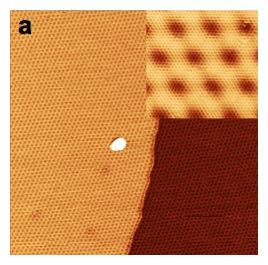 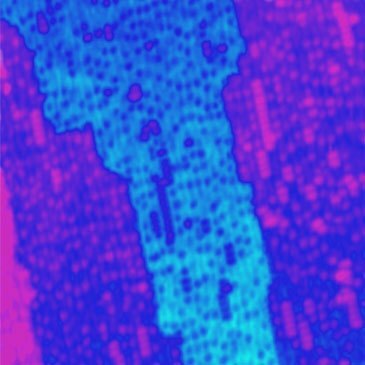 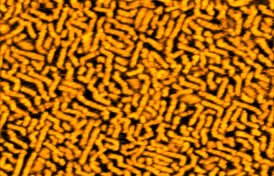 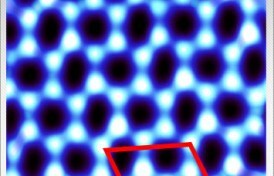 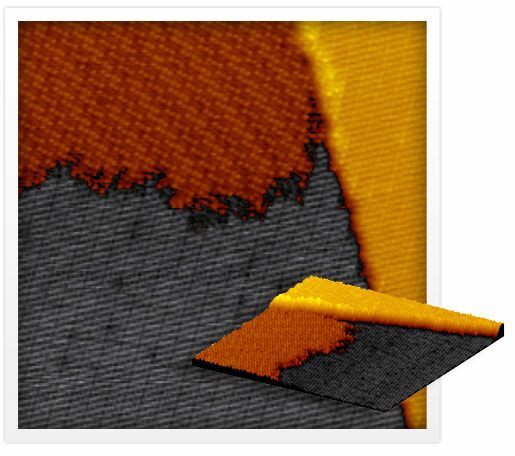 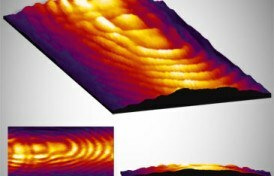 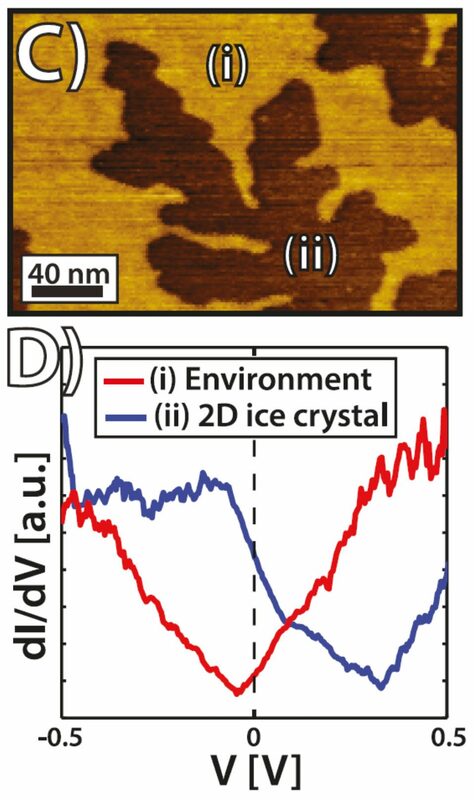 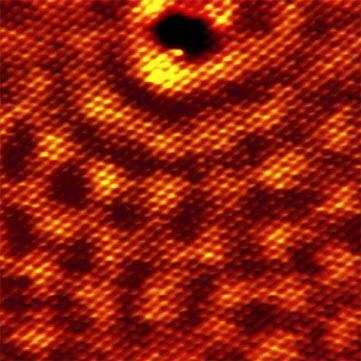 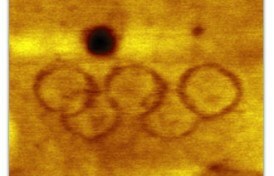 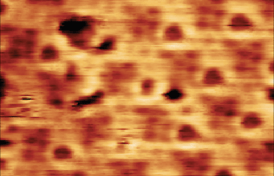 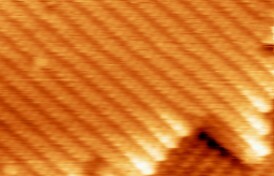 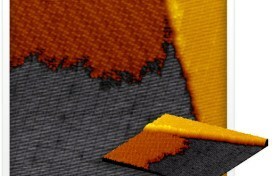 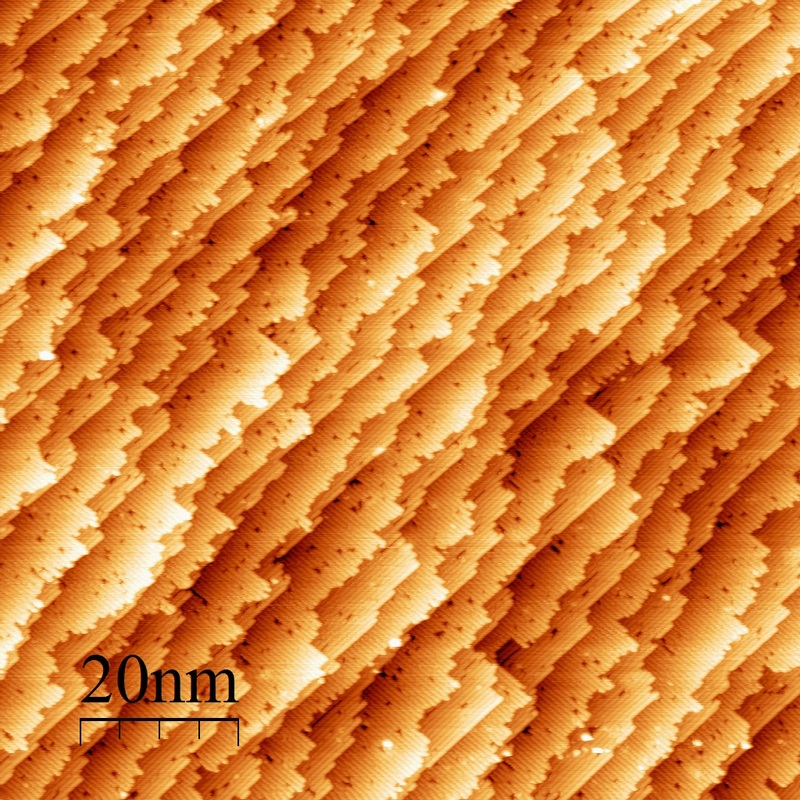 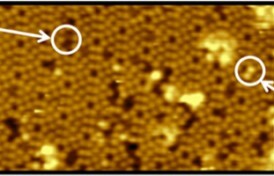 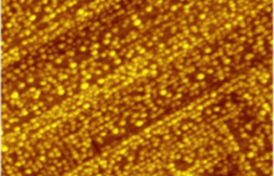 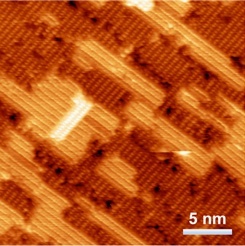 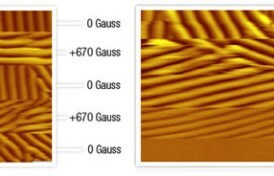 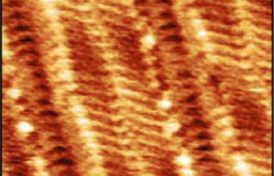 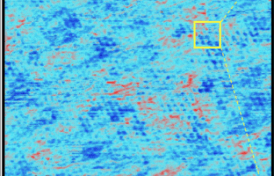 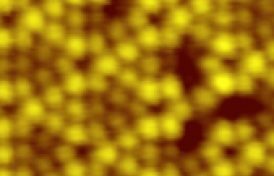 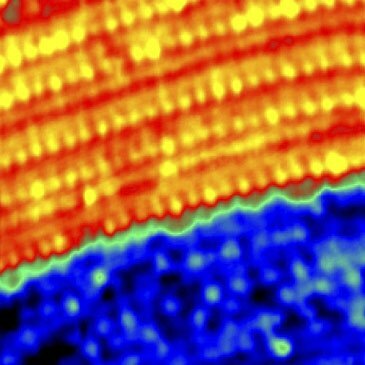 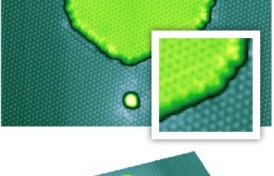 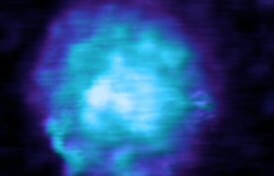 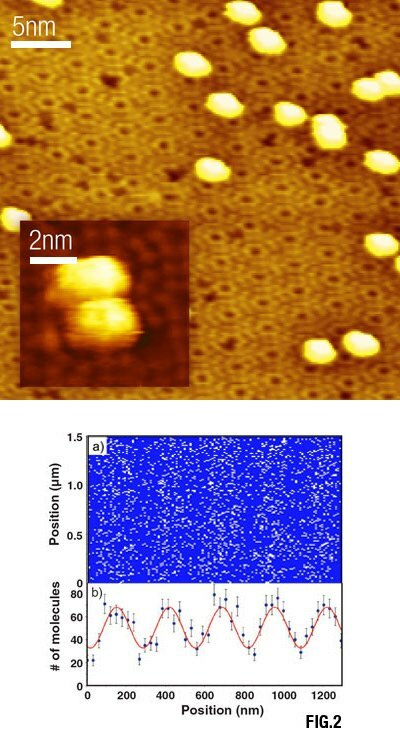 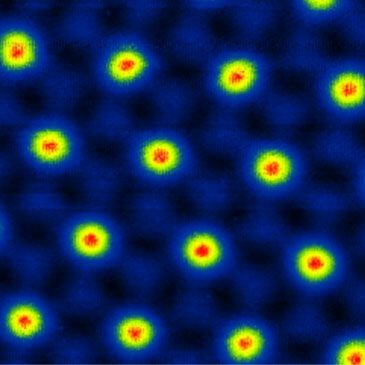 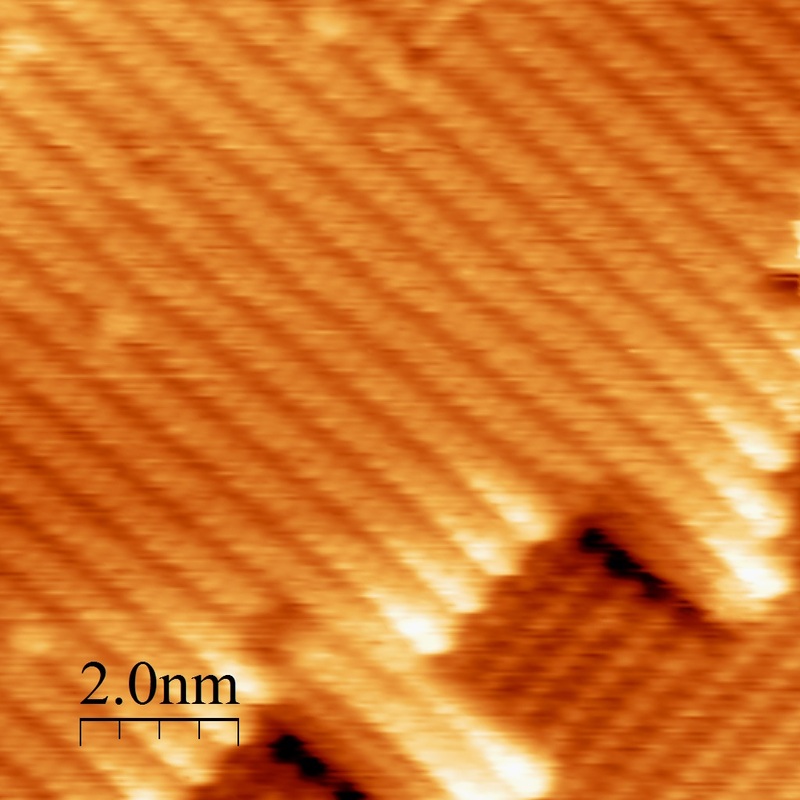 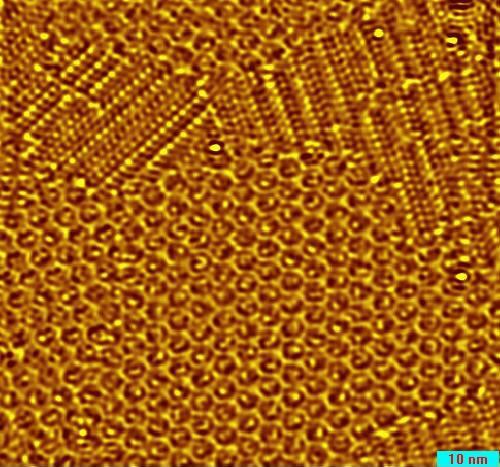 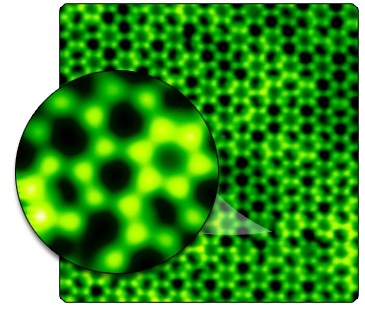 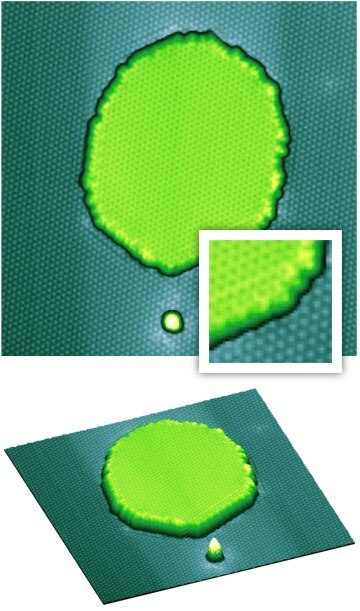 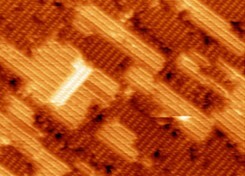 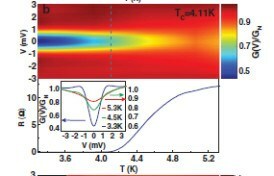 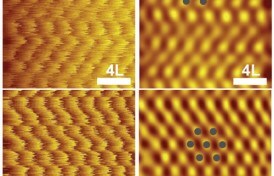 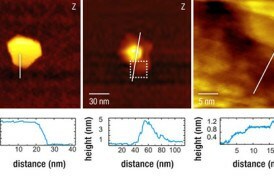 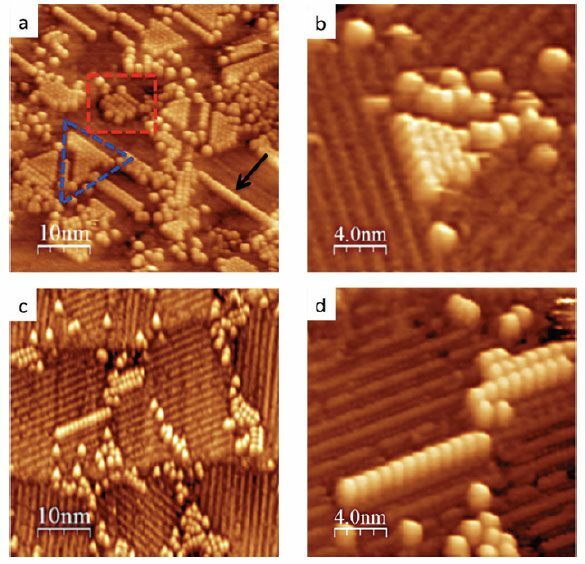 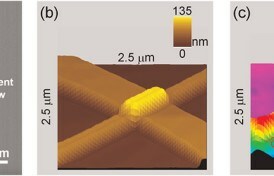 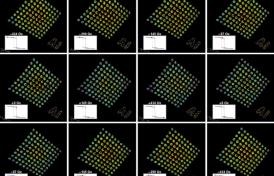 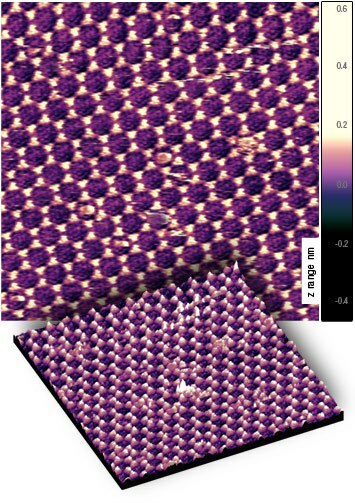 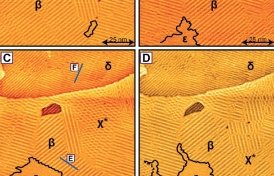 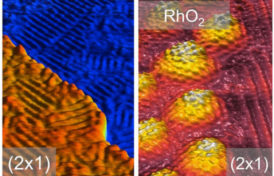 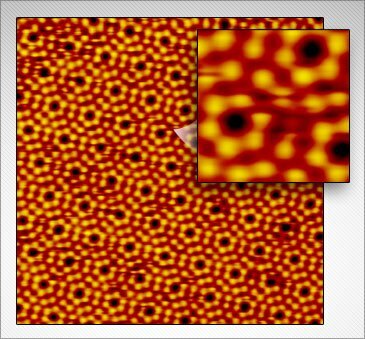 (inset) Atomically resolved STM image of the moiré (1 nA/0.1 V). 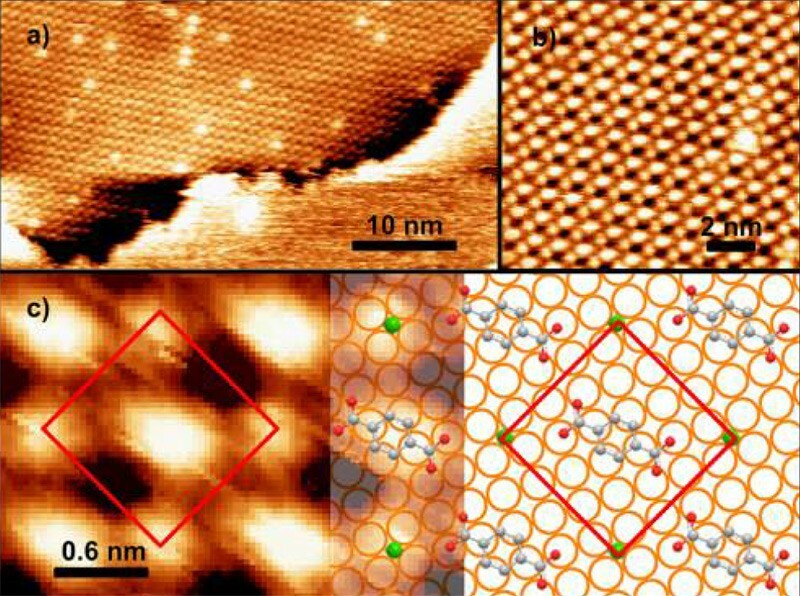 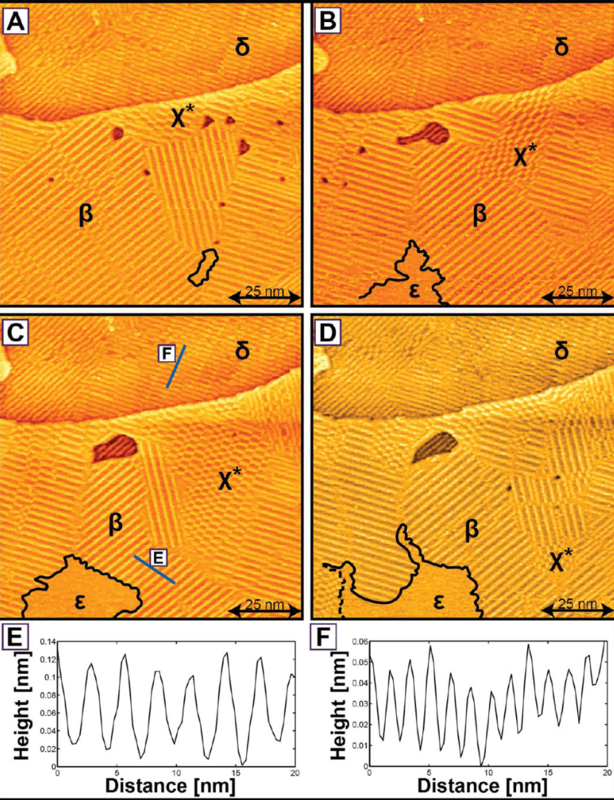 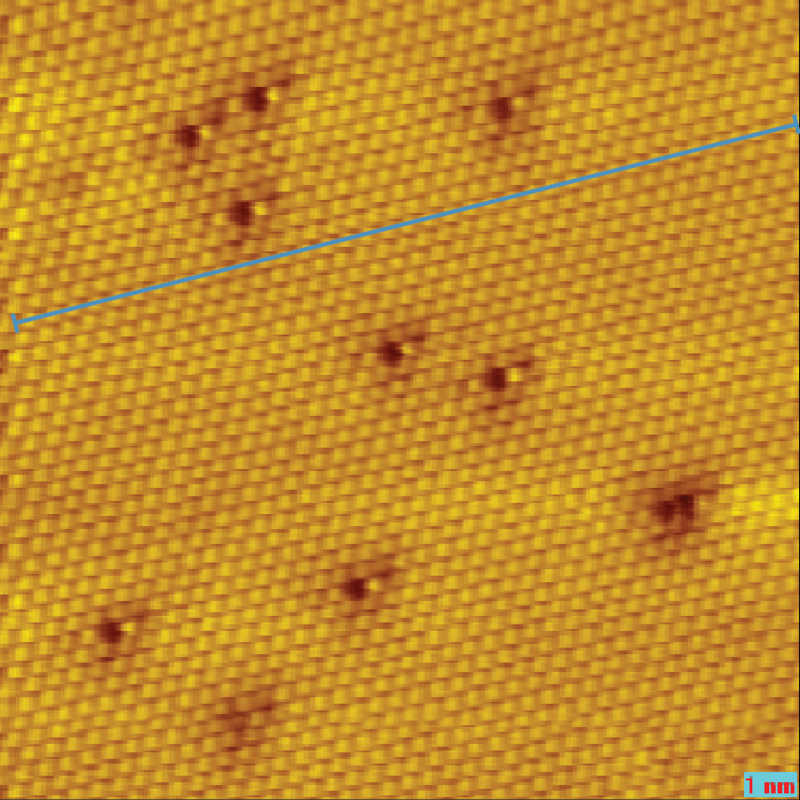 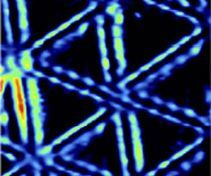 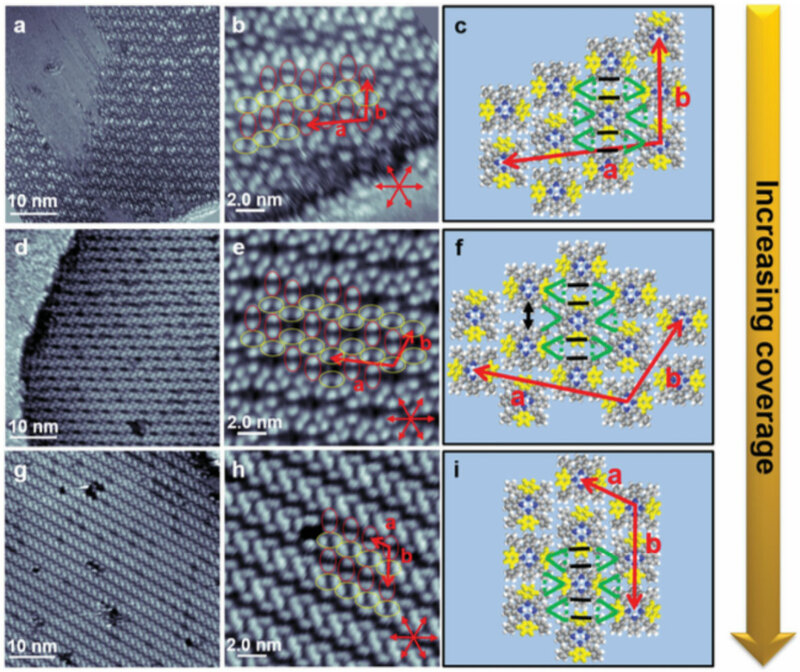 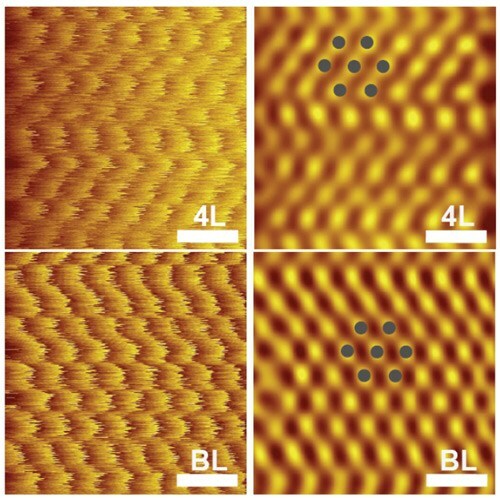 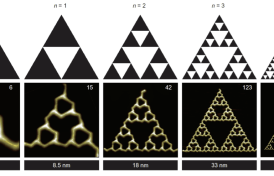 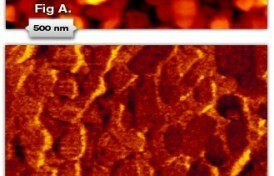 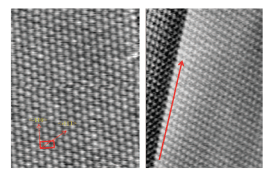 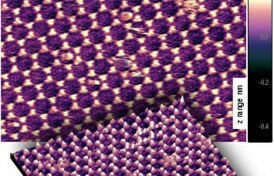 The hexagonal pattern is the moiré caused by the lattice mismatch between graphene and Ir. 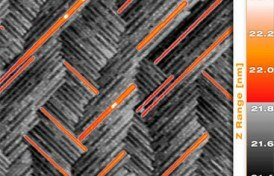 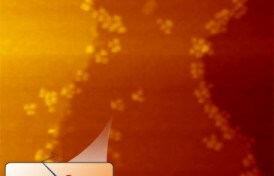 Sampsa K. Hamalaïnen, Mariia Stepanova, Robert Drost, Peter Liljeroth, Jouko Lahtinen, and Jani Sainio – Department of Applied Physics, Aalto University School of Science in Otakaari, Finland. 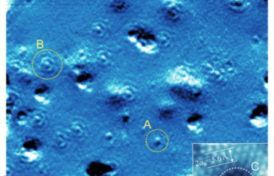 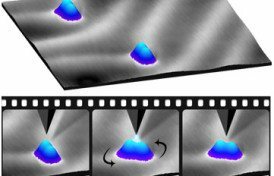 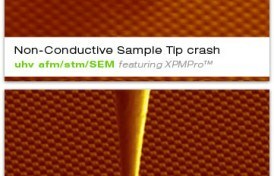 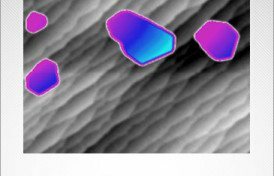 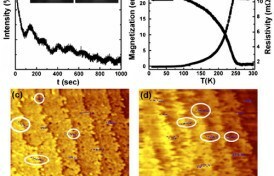 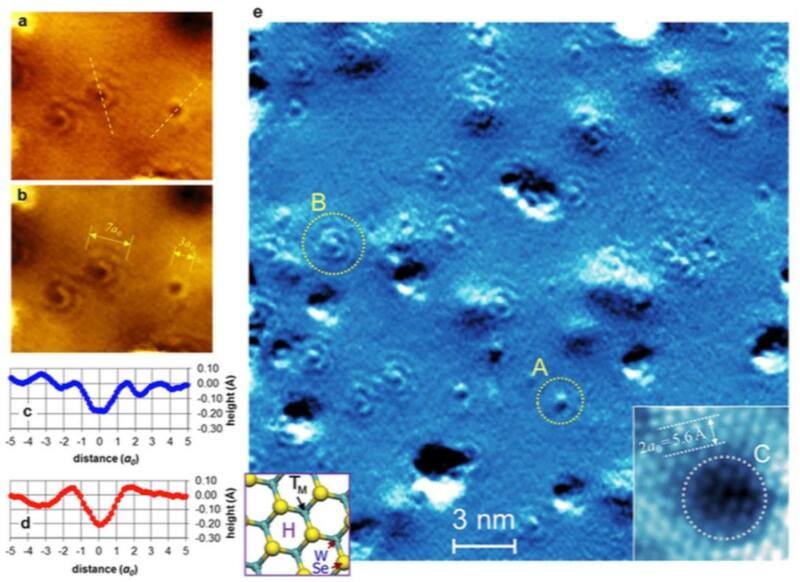 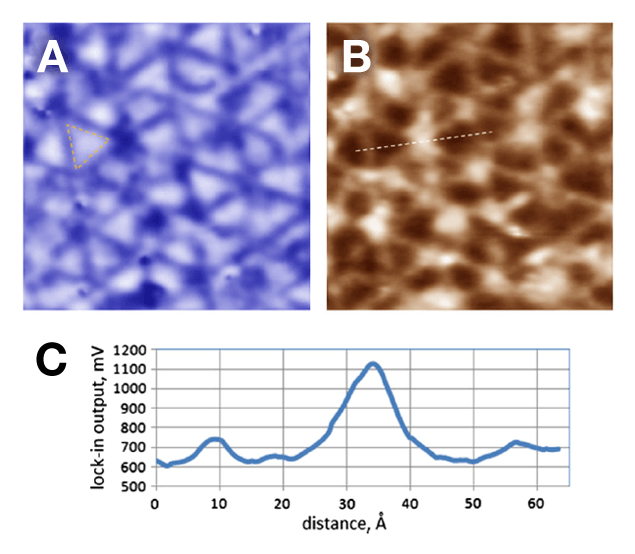 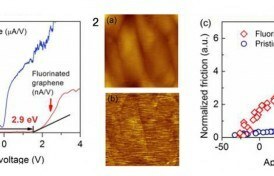 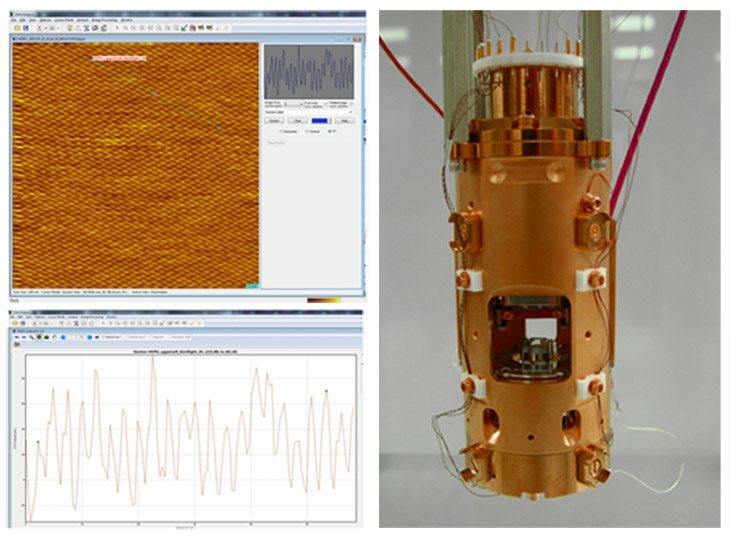 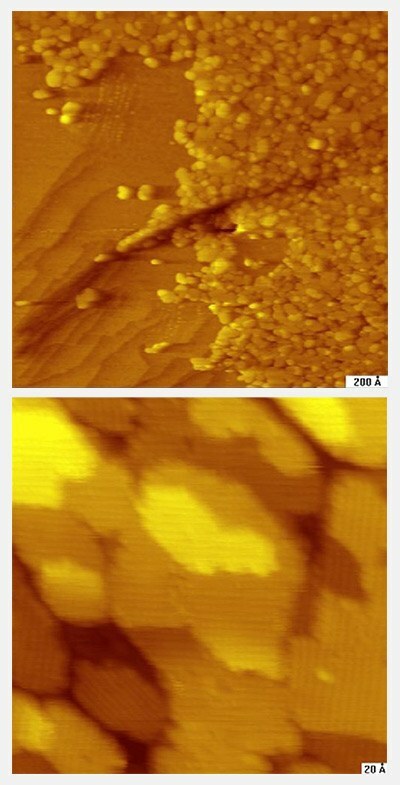 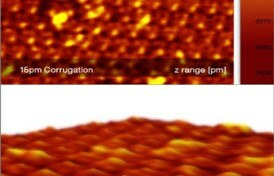 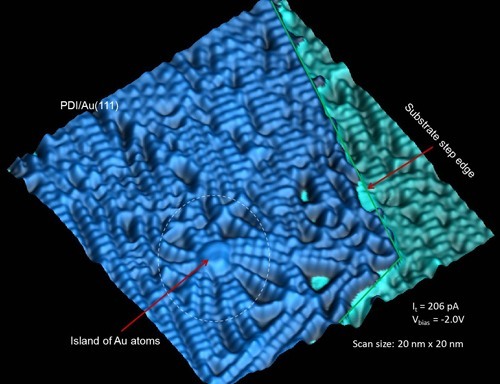 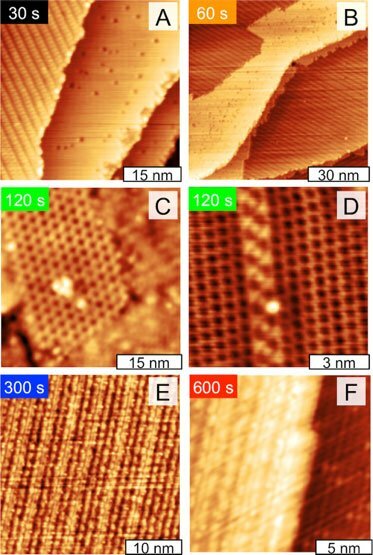 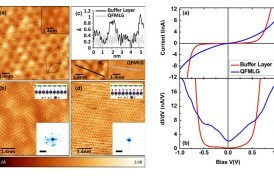 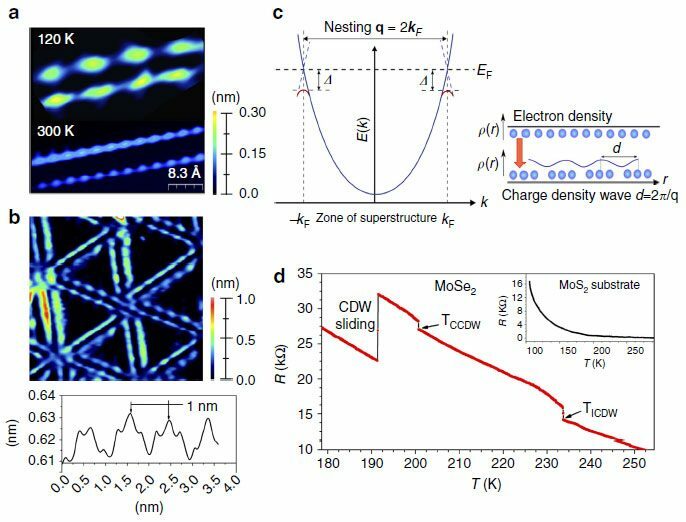 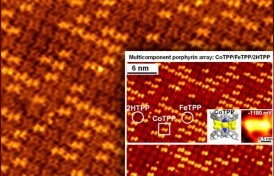 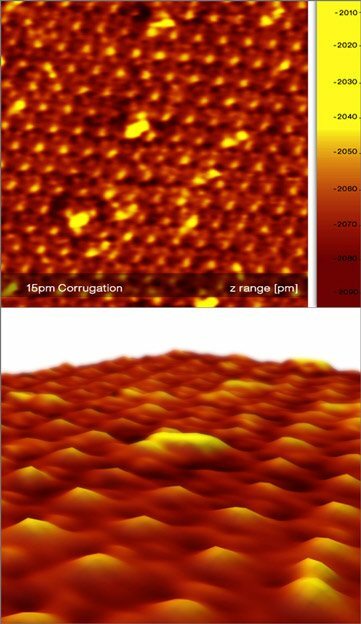 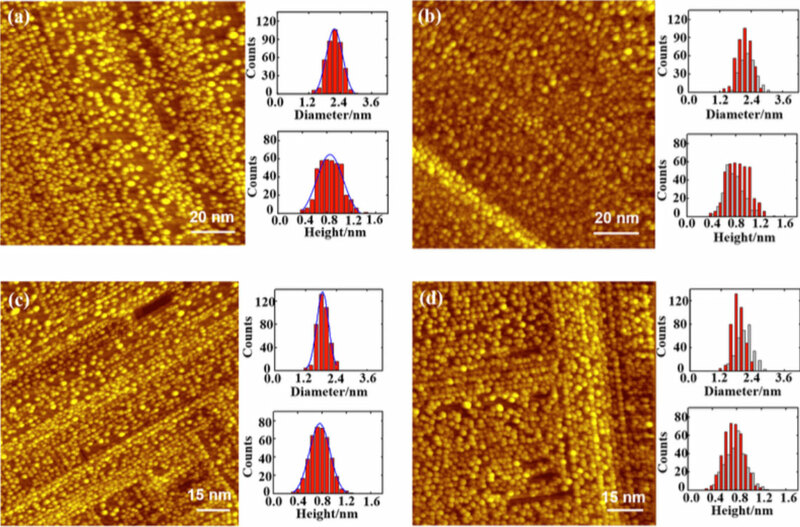 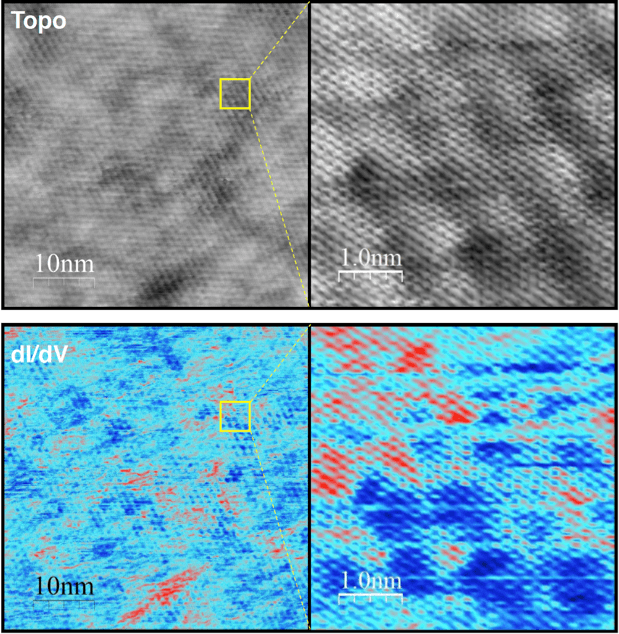 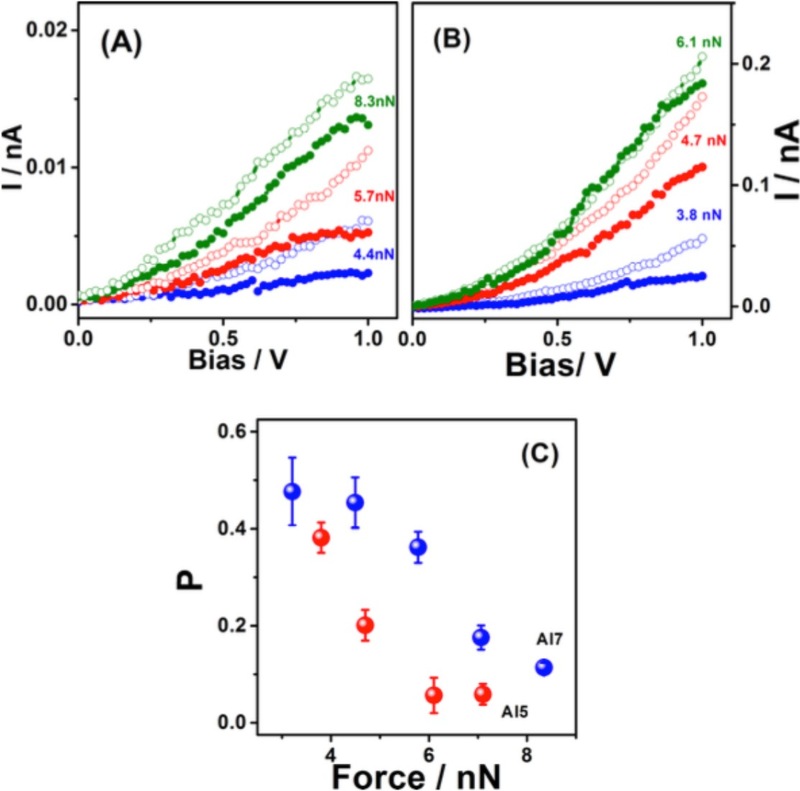 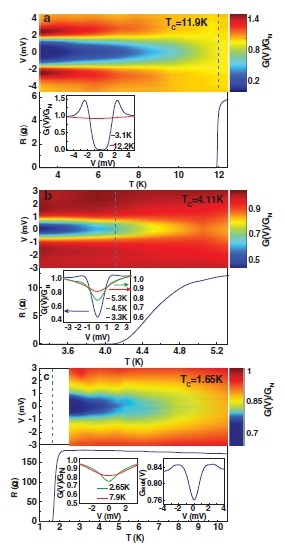 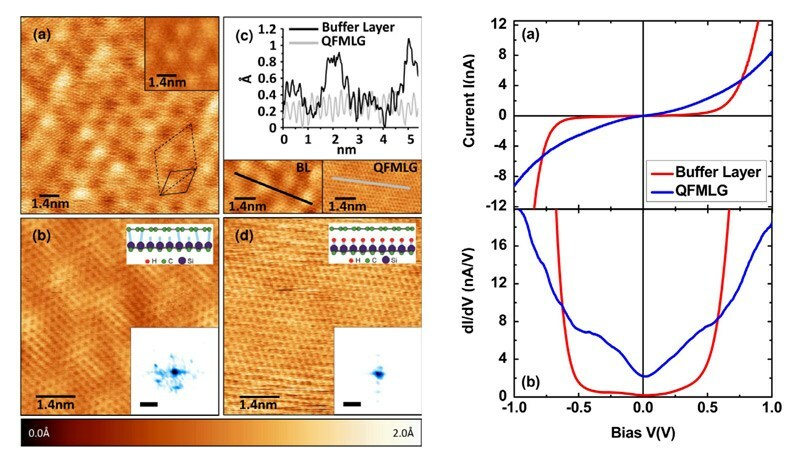 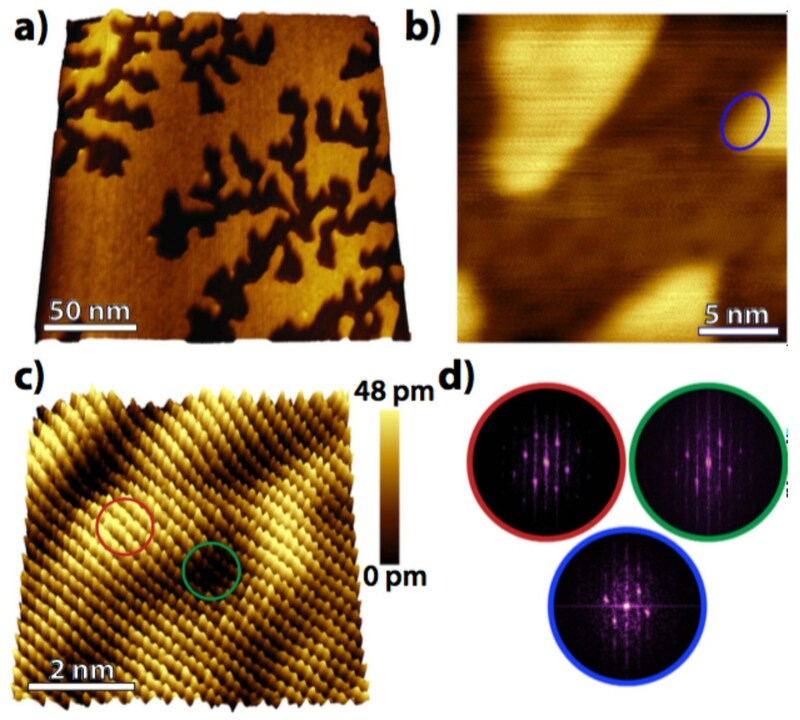 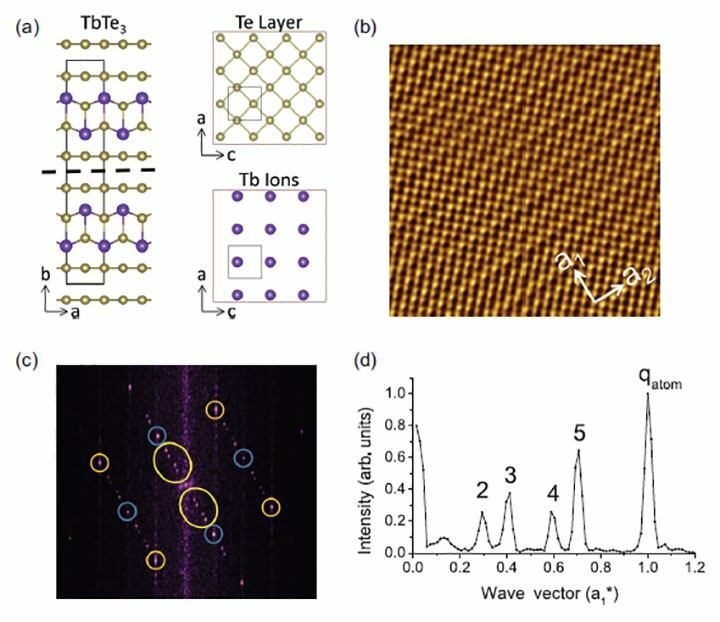 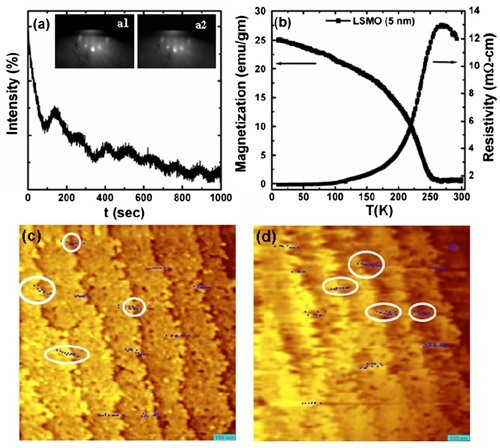 We have studied the adsorption and self assembly of cobalt phthalocyanine (CoPc) on epitaxial graphene grown on iridium (111) by scanning tunneling microscopy (STM), Auger electron spectroscopy, and low energy electron diffraction (LEED). 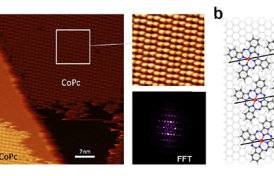 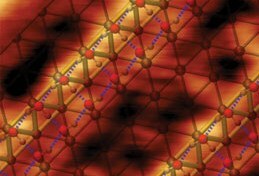 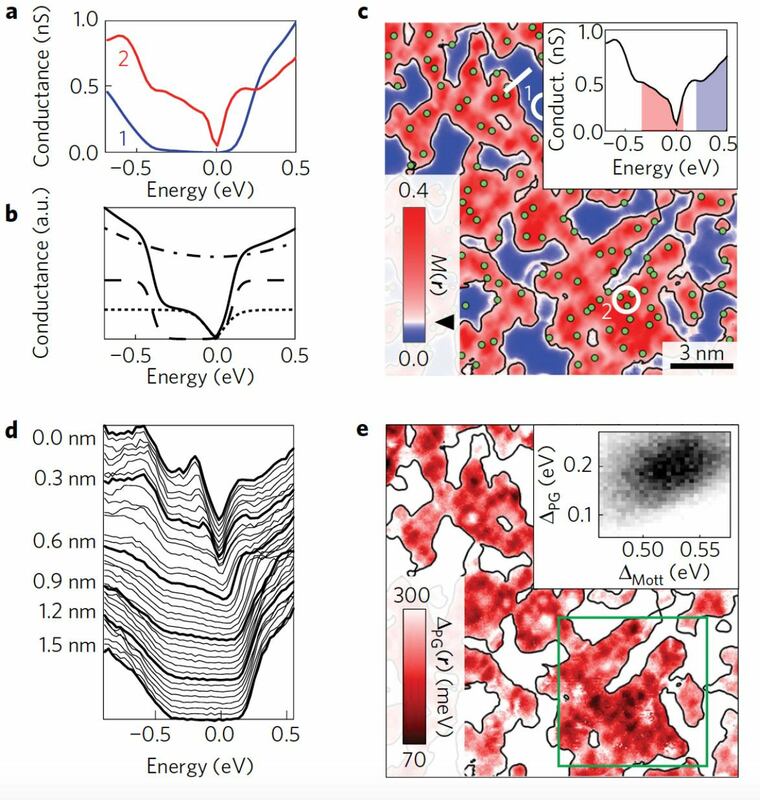 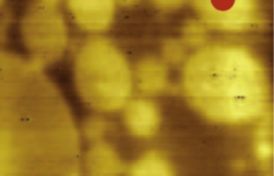 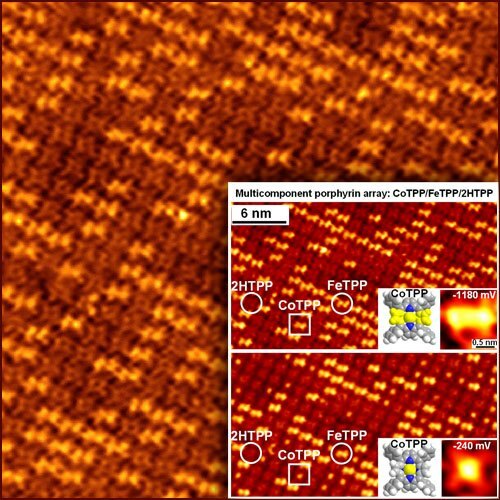 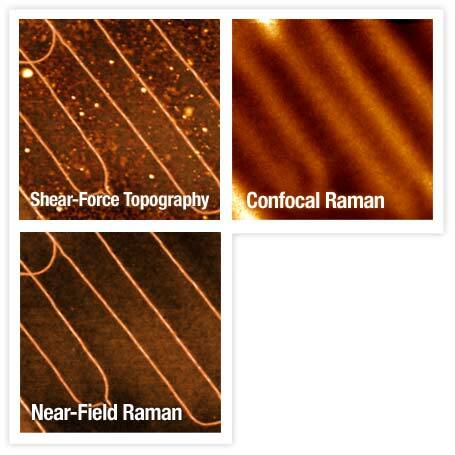 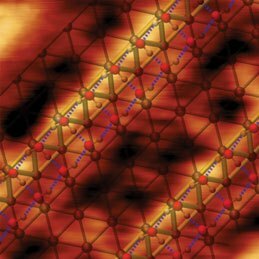 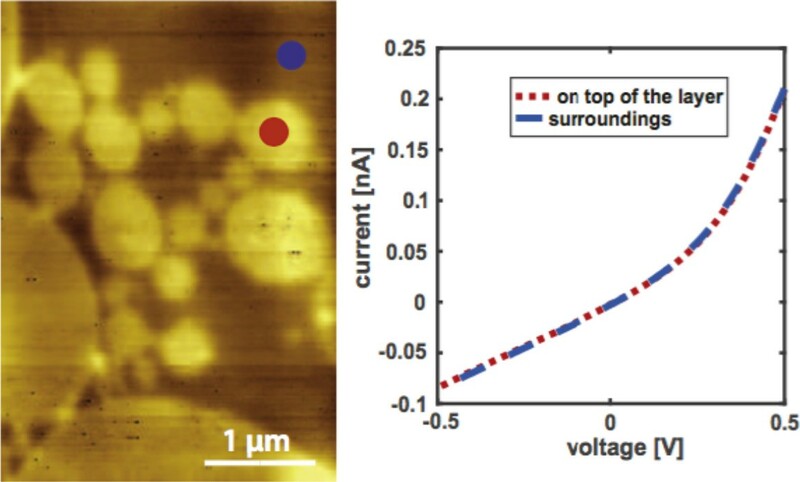 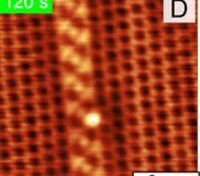 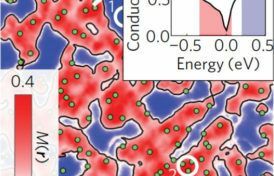 CoPc deposited on graphene/Ir(111) at room-temperature self-assembles into large, well-ordered domains with a nearly square unit cell. 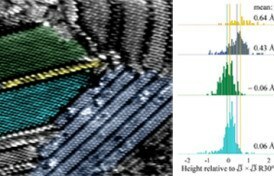 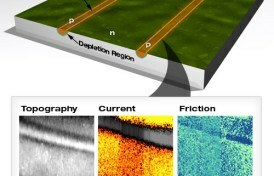 On the basis of the observed LEED pattern and STM images, a detailed structure for the overlayer is proposed. 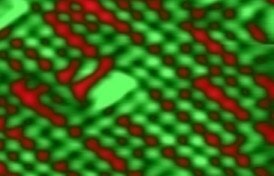 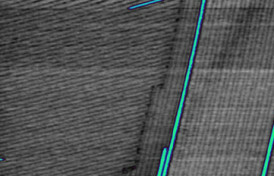 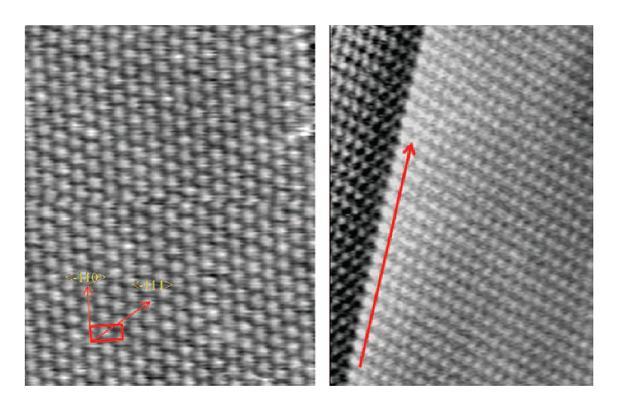 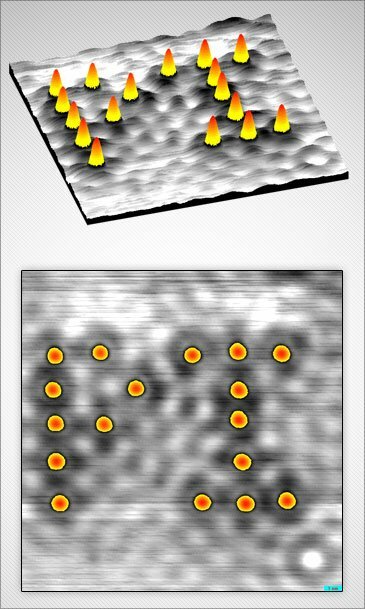 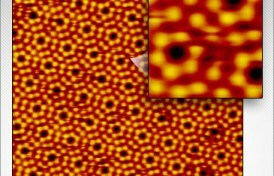 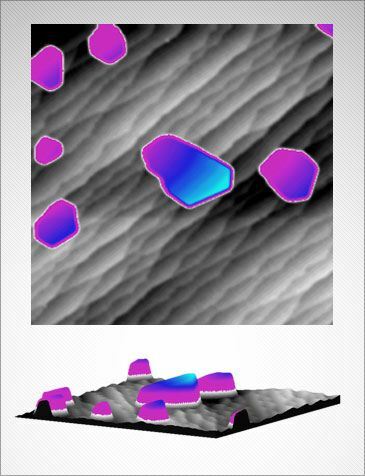 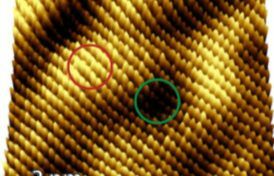 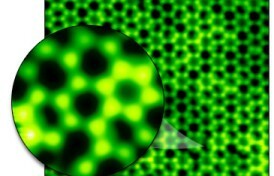 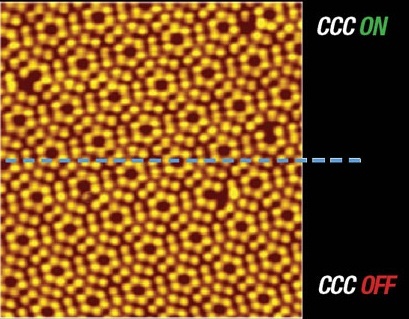 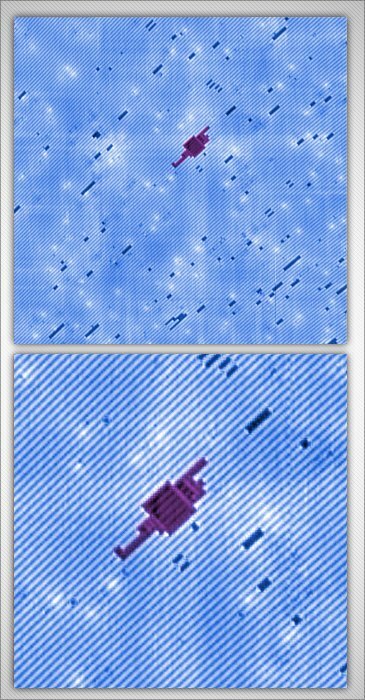 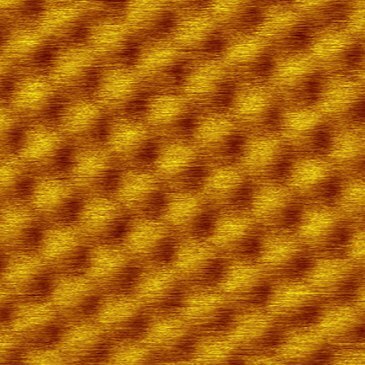 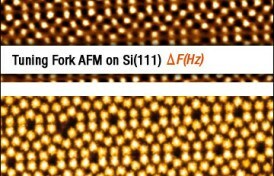 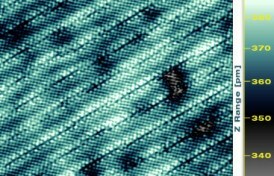 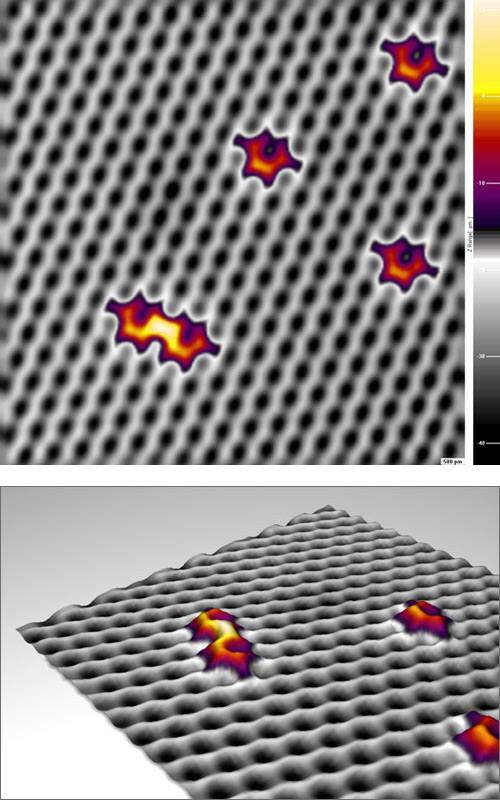 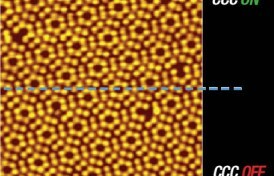 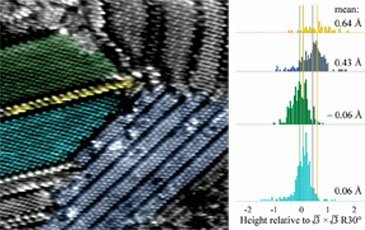 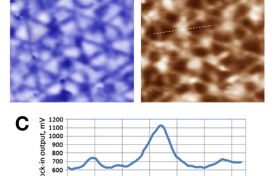 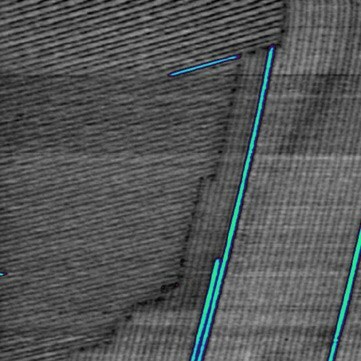 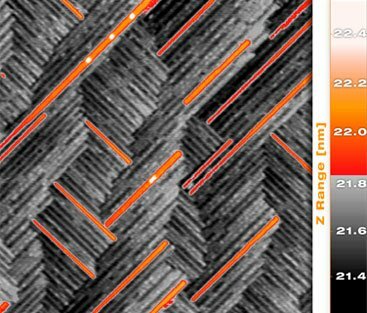 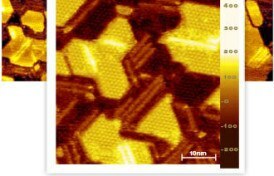 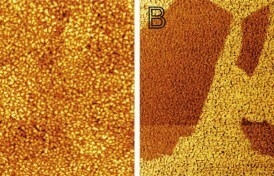 Despite the corrugation of the moiré pattern of graphene on Ir(111), its hexagonal symmetry is not translated to the CoPc layer. 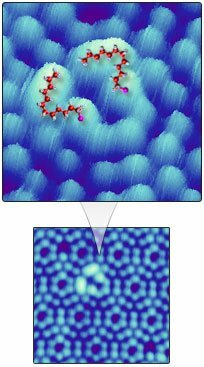 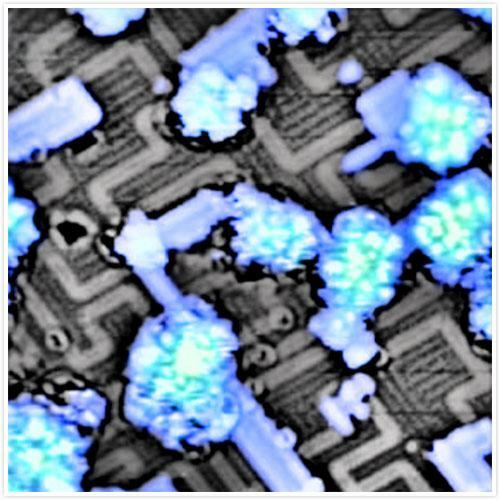 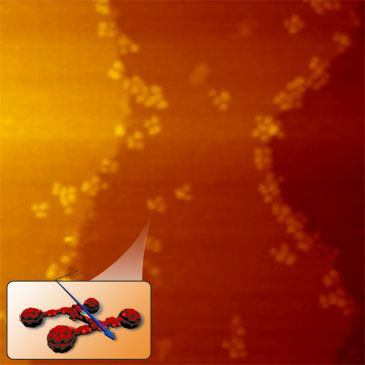 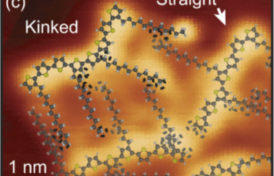 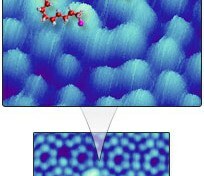 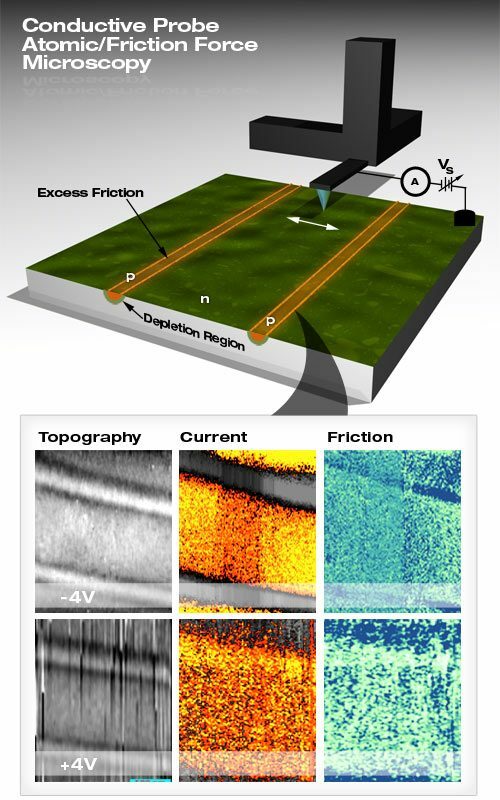 This is in contrast to systems with stronger graphene−metal interaction that makes graphene on Ir(111) a convenient, clean, and well defined model system for studying molecular doping of graphene.